Welcome to our CD review page . 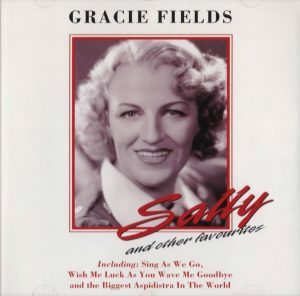 . .
We hope our page will help towards making an informed selection on which Gracie CD’s to buy, and which to avoid. There are dozens of compilations out there, ranging in price from as little as a £1, all the way up to £30 or more, but cost is never an indication of quality. Many are made up of old transfers from original 78 record, scratches, jumps and all, whilst others have been lovingly remastered to crystal clarity. Our reviewers . . .
Jim: I’m not intending mine to be critical reviews of the music, but just a few comments on the quality of the sound, and where known (or surmised), the origin of the transfers. During the vinyl era (perhaps I should say the 1st vinyl era!) 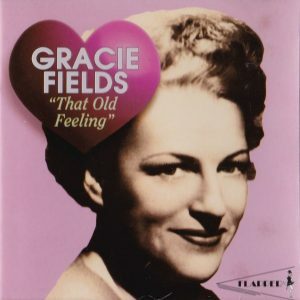 most of Gracie’s records were still in copyright and mainly issued by EMI and Decca who had made the original recordings. 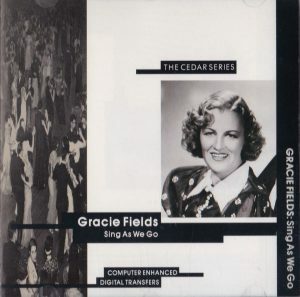 The advent of CDs, and later, noise reduction devices, such as Cedar, coincided with Gracie’s recordings coming out of copyright. Annie: I have no technical expertise, so my reviews are based mainly on the quality of sound, and the selection of tracks. Most of my listening is done in the car, so unless the transfers are reasonably clear, I shan’t be listening to them. 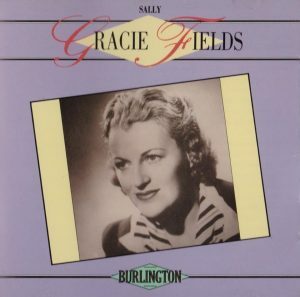 Jim: The late Colin Brown produced Gracie’s first CD on his own Burlington label. Colin had worked for Decca and had produced the Decca ‘Recollections’ nostalgia series of LPs. The transfers are from his own 78 r.p.m. records and are pre-Cedar. Noise reduction was effected by filtering out the top frequencies, or ‘filleting’ them as he used to say. The transfers are consequently very dull and still quite noisy. It was issued in 1988 and included tracks recorded before 1937 (HMV and Rex). There was no digital processing of any sort; the CD being mastered from an analogue master tape. In fact you can hear the tape hiss! The sleeve notes are by Nathan Pollard. 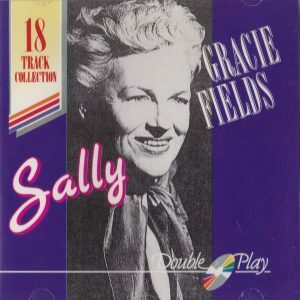 Jim: Gracie’s second CD was issued in 1989 on Conifer’s Happy Days Series. It was compiled and transferred by the late Kevin Daly. Kevin had also worked for Decca and was a keen George Formby fan and collector. This issue was also pre-Cedar but Kevin had spent many years perfecting ways of reducing the crackle from 78s without dulling the sound too much. Although there is some blasting from the worn louder sections of the original records, this CD is still very enjoyable to listen to. It consists of Rex recordings from 1935 to 1937. 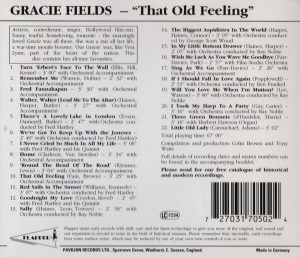 The sleeve notes are by Geoff Milne, another name that will be familiar to collectors of Decca nostalgia. Jim: 1989 saw the arrival of a second CD from Kevin Daly on the new and short-lived Stage Door label. Kevin is not mentioned anywhere on the CD and the presentation could at best be described as minimal. There are no sleeve notes and the front cover is just a single sheet with a brick wall on the front and dancers on the back. The disc, however, is a revelation. It consists of fine transfers of radio transcriptions from the late 1930s. When I first heard this I was convinced the recordings were made on tape. They are, in fact, transfers from vinyl 78 transcription discs. Some of these had been used earlier on the Decca ‘Focus’ LP set. Fred Hartley is ever present and although some people are not keen on his accompaniments I quite like them. 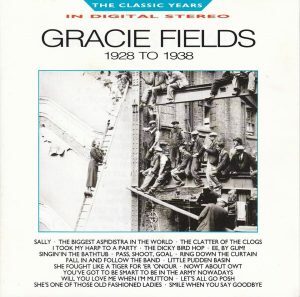 Gracie herself is in fine form and it is always interesting to hear alternative performances of well-known favourites. Highly recommended! Jim: A second offering from Colin Brown was issued in 1989, this time on the ASV Living Era label. Again compiled from Colin’s own collection, the transfers are typically dull. At least one track is transferred from a radio transcription disc similar to the ones used on the Stage Door CD. Unfortunately, the sound quality is not similar. (Perhaps this was from a standard shellac pressing rather than a vinyl one?) Sleeve notes are by Peter Gammond. The CD was manufactured by PDO and, like many of the discs made by them at this time, mine has begun to ‘bronze’. 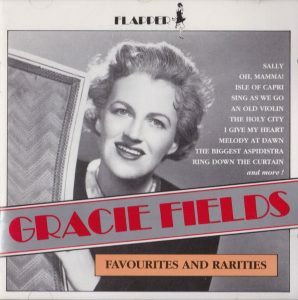 Jim: The fifth Gracie CD, and fourth to be issued in 1989, was ‘Favourites and Rarities’ on Flapper. This was Pearl’s ‘popular’ label. The late Charles Haynes was one of the leading lights behind this label, acting as a sort of producer. Charles contacted record collectors and ‘hired’ their records for issue on Pearl or Flapper. Transfers were usually by Colin Atwell, as they are here. Pearl and Flapper’s boast on their sleeve notes was that they gave you more of the ‘original, real sound’ and they certainly did! There was no digital processing and very little filtering. The sound is virtually straight off the record with plenty of ‘original, real’ crackle. However, the ear quickly adjusts and the basic sound is good. It helps that the original records used for ‘Favourites and Rarities’ are in good condition. They come from the collection of Maurice Warburton. 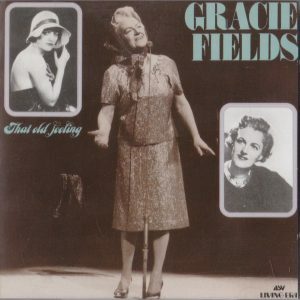 Being a 1989 issue the CD includes a few Regal Zonophone tracks recorded in 1938. 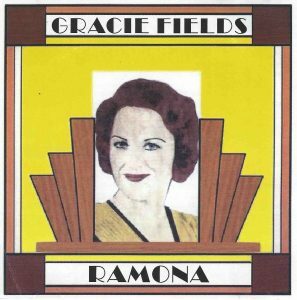 It became popular in the 1970s and 80s for pop stars to have their own, personalised record numbers but Gracie did it first! She had her own matrix series for these new Regal Zonophone records (not the HMV reissues) – 0GF 1, 0GF 2, etc. It is often wrongly written as OGF (letter O rather than number 0) and that mistake appears in this booklet. The 0 stands for 10 inch record. Had there been any 12 inch records in the series their matrices would have been 2GF. 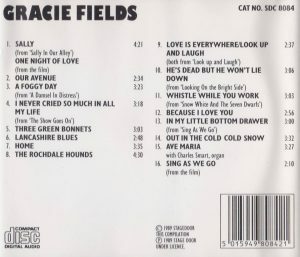 The sleeve notes for this CD are written by Gracie biographer Joan Moules. 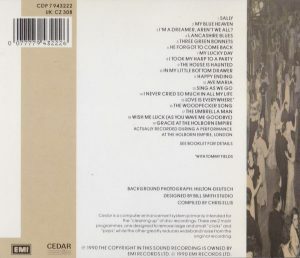 Jim: 1990 saw the issue of the first CD from EMI and it was also the first to use Cedar processing. It contains many of the popular HMV and Regal Zonophone records and also the live “Gracie at the Holborn Empire” in its shortened RZ form. 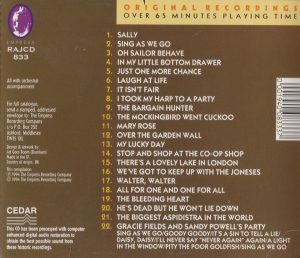 The longer HMV version had appeared earlier on a World Records LP. Several ways were used to fit it on to 10 inch records. Verses and patter were cut and May Morn is actually speeded up! Different performances were used for the last two sides and for that reason alone it is essential to have this version as well as the 12 inch version. As for the sound quality, I was actually disappointed when I first heard this CD. Previous LP issues from EMI had always been carefully re-equalised whereas I felt in this case the records had just been ‘Cedared’ and that was all. However, listening now, 26 years after it was issued, I think it sounds fine. Sleeve notes are by Michael P. Kennedy. Jim: Throughout the 1960s record companies had issued both stereo and mono versions of LPs. To remove the necessity for this duplication they embarked upon a ‘stereo for all’ campaign. Compatible cartridges, which could play stereo records in mono without damaging them, were introduced and mono LPs were phased out. Having persuaded everyone that stereo was better the record companies still wanted to sell their older mono recordings and so began the era of ‘reprocessed stereo’. Although it had largely died out by the time CDs were introduced the idea made a resurgence in the 1990s. Robert Parker, an Australian sound engineer and broadcaster, came up with the ‘new’ idea of creating stereo from old mono recordings. With a combination of noise reduction, re-equalisation, filtering different frequencies to left and right and generous application of echo and reverberation, he created an ambient sound which could breathe new life into old recordings. 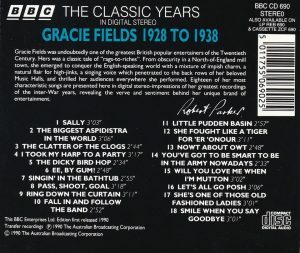 The BBC licenced his recordings for broadcast, mainly jazz and dance band records, on which the process worked best, and issued a number on CD. Gracie’s seventh CD was one of these. 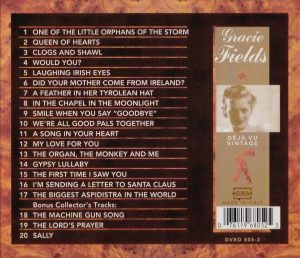 A companion CD of records by Flanagan and Allen is quite a revelation, but I don’t think Gracie’s is quite as successful. The closer crooning, or, in the case of Chesney Allen, talking, style of this duo was opened up by this process. 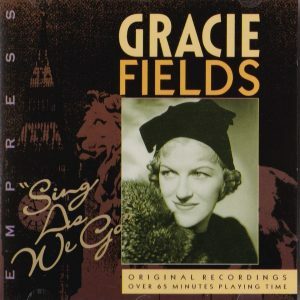 However, because Gracie was a powerful singer she didn’t need to be placed as close to the microphone in her recordings and they already have a certain ambience. In my opinion, Robert Parker’s process produces a sound that is over reverberant. Added to this, the noise reduction is not fully successful and background noise comes and goes, which is more distracting than if it was constant. Despite my quibbles, this CD is worth listening to and I’m sure many people will find the sound perfectly acceptable. It was originally issued in 1990 and has sleeve notes by Alison White. Jim: Tring was a company that specialised in cheap nostalgia discs containing re-recordings or live recordings of older popular hits and artistes. Later they went ‘up-market’ and produced a series of excellent classical CDs with the Royal Philharmonic Orchestra. 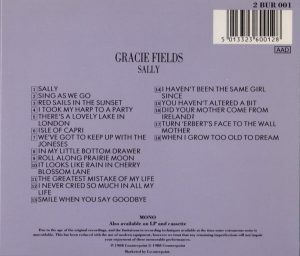 The back of this eighth Gracie CD has the words, “This album contains some tracks that are re-recorded.” Not quite true! More accurately it should have said ALL the tracks, and added that they were re-recorded from another CD! The 1990s saw an increase in budget labels wanting to cash in on the nostalgia boom. They realised that by dubbing tracks from existing LPs they could produce CDs with reasonable sound and with very little effort. This CD goes one step further and just re-arranges the tracks from the Robert Parker CD. Of all the existing CDs to use they chose the one with the most distinctive sound and which was most easily recognisable. It was issued sometime between 1990 and 1993 – I can’t remember when and there is no date on the disc or sleeve. 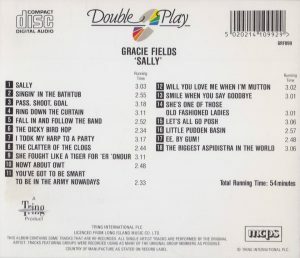 There is a short, uncredited, biography of Gracie and a track list. It was re-issued with an alternative cover, but the same catalogue number. 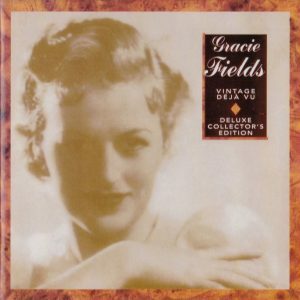 Jim: Collectors had to wait a few years for the next Gracie CD. Then 1994 brought two CDs from the partnership of Colin Brown and Tony Watts. The first was on Colin Brown’s new Empress label. This man has to be admired for the sheer volume of nostalgia issues he was responsible for during these years. It is just a shame that many of his transfers can at best be described as basic. The Empress CD is no exception. Although the sleeve states that Cedar has been used the sound is dull and a lot of surface noise is still present. I think that the Cedar processing has been applied to existing tape transfers which have already had the top frequencies filtered away. Cedar actually needs to work on the full frequency range straight off the record. 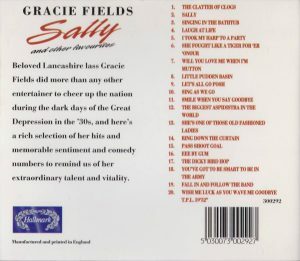 It is a shame as the CD contains an interesting selection of Gracie’s songs with the emphasis on comedy. The excellent sleeve notes are by Tony Watts, but, as with all these Empress CDs, there are no details of catalogue or matrix numbers of the records used. 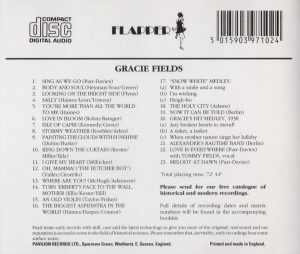 Jim: The second CD from Colin Brown and Tony Watts in 1994 was the second Gracie CD to be issued on Pearl’s Flapper label. The sound from this CD is far better than the previous Empress CD. Although it is not stated, I think Cedar, or a similar digital processing system, has been used and this time more effectively. The sound still hasn’t been re-equalised and so is still lacking in top frequencies, but at least there has been no further filtering. For a simple comparison between the sound on this CD and on the previous one just listen to ‘Sally’! The sleeve notes are again by Tony Watts. They are the same as on the previous CD – but totally different! By that I mean the content, paragraph by paragraph, is the same but the actual wording is different. This is one of the CDs that managed to perpetuate the myth of a second recording of ‘Biggest Aspidistra’ (Aspidastra?) on Regal Zonophone. The booklet includes full matrix information for each track and lists this track as being Regal Zonophone 0GF 18, whereas it is the ordinary version 0GF 4. It was Brian Rust who first listed this in his partial Gracie discography in his book ‘The Complete Entertainment Discography’. Research by Chris Webster has indicated that 0GF 18 was a dubbing of 0GF-4 with attempts to make it sound like a live performance by adding laughter, cheers and applause from effects records. Rust states that this was issued on MR 3001 coupled with ‘You’ve got to be smart in the army’ while 0GF 4 was issued on MR 2889 coupled with ‘Now it can be told’. To date, all copies of MR 3001 that we have heard use the standard 0GF 4 take. Jim: The Déjà Vu CD was issued in 1995 and is a bit of a curiosity. 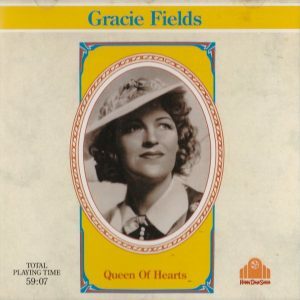 Fifteen of the tracks were taken from Kevin Daly’s Queen of Hearts CD . The sound is fuller and extra reverberation has been added but the transfers are still recognisable. There are then two tracks – ‘I’m sending a letter to Santa Claus’ and ‘The Biggest Aspidistra’ (Hitler version) – that appear to be new transfers. At the time, Santa Claus hadn’t been issued on LP or CD and the Hitler Aspidistra had only appeared on the Empress CD in much poorer sound. The transfers are good and again have added reverberation. 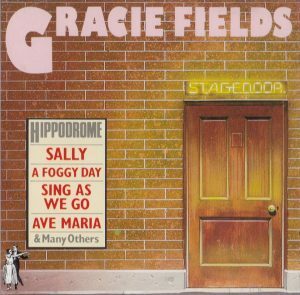 The next two tracks are dubbed from the soundtrack of the film ‘Stage Door Canteen’ and finally there is Sally from the 1952 Palladium recording. There is a glossy, sixteen page booklet with very little content – a sentence per page – and some period line drawings including a cylinder phonograph. Gracie definitely did not record any cylinders! 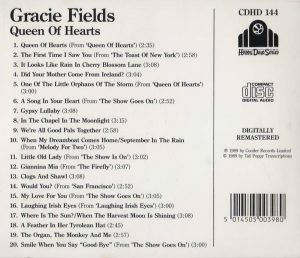 However, the list of tracks includes, dates, matrix and take information, although, in the case of the fifteen ‘Queen of Hearts’ tracks, this was probably taken from the sleeve of that CD. Jim: The second CD of 1995 was from Hallmark. There is very little to be said about this CD. 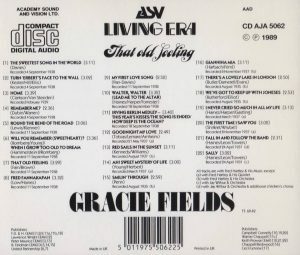 It is another copy of the Robert Parker CD, this time with two extra tracks – ‘Laugh at Life’ which had appeared on the Empress CD and ‘Wish me Luck’ which could have been taken from any of the LP re-issues. There are no sleeve notes. 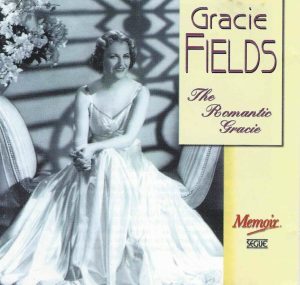 A great selection of Gracie’s best romantic recordings. Transferred from the original 78’s the sound is clear and sharp. The highlight for me being, ‘I Love the Moon’, a song packed with history and romance, having been written for Phyllis Dare by her consumptive fiancee Paul Rubens, who died shortly afterwards, Phyllis never marrying. Then it was the song Gracie chose to sing from her hospital bed when she gave her thanks to the nation following her serious illness in 1945. My only quibble; who on earth thought ‘Waiata Poi (Tiny Balls)’ and Nagasaki’ were romantic songs? If anything their cheerful uptempo beat will put a dampener on a romantic candle lit supper, and in my opinion somewhat spoil the selection. Saying that, if Archie and me are having a romantic night in, this is the CD I put on. 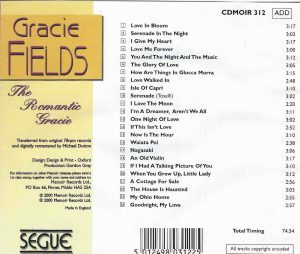 An excellent selection of both comic and romantic songs, even though the compiler has on several occasions professed to hate Gracie’s comic efforts! 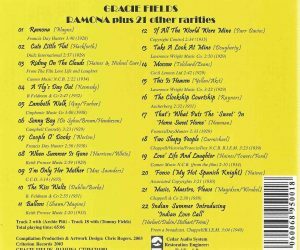 This compilation includes several seldom heard songs (on compilation CD’s at least). Great sound quality by restoration engineer Ted Kendall. Once you get past the lurid cover image of a noseless Gracie, and the sloppy spelling, and mistakes in the notes, a very good compilation. Probably one of the best single CD collections, and at as little as £3 on Amazon, a good entry level collection.